For many years Aerosaurus Balloons have provided visitors to their web site the facility to view forthcoming flights and reserve dates online. Previously, owing to the main flying season for hot air balloons in the UK being from April to October, this facility has not operated during the winter months. The last 3 winters has shown that with the confused weather patterns we are experiencing more settled weather in winter than previously, and more unsettled, often very wet, weather in the so called “best weather” months of May – August. As a consequence this winter Aerosaurus Balloons intend to operate a Winter Flight Schedule to service both existing balloon flight voucher holders, and private/exclusive groups, these flights being able to be viewed and booked either by phone or Flight Availability online. 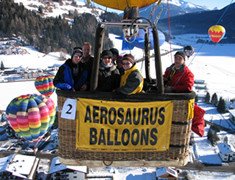 Additionally, for those passengers who have a degree of flexibility regarding their availability, Aerosaurus Balloons operate a standby facility whereby balloon flight voucher holders can be alerted by text or email of forecast good weather and thus have the opportunity to book a flight taking advantage of the forecast.